At the end of April in Wrocław a workshop titled “Digitization in cultural and local administration institutions” was organized by Digitalizacja.pl and Wrocław Institute for Professional Activity. As a part of this workshop Tomasz Parkoła and Adam Dudczak from PSNC were also speaking. They presented the set of software dLibra/dMuseion/dArceo/dLab supporting institutions in digitization and on-line publishing of collections and e-learning courses on digitization and building digital libraries designed for employees of small cultural heritage institutions, available in the Digital Libraries Federation portal. 900 000 objects in the database of Polish Digital Libraries Federation! 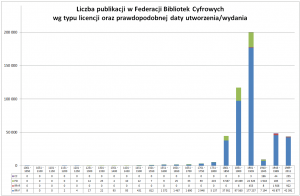 On the 28 February number of objects available via Polish Digital Libraries Federation reached 900 000. Publication which was entered to the Federation database on position 900 000 comes from the Ossoliński National Institute, was made available via the Dolnośląska Digital Library, and is titled “Legiony Polskie. Kartoteka legionistów internowanych w 1918 r. na Węgrzech i w Polsce. Pudło 3: Lit. F-I”. Distributed Catalogue of Polish Libraries (KaRo), allowing to search the contents of library catalogues from several tenths of Polish libraries (including National Union Catalogue and the National Library) is available in the new version – KaRo 3. Cooperation between the KaRo author and the PSNC Digital Libraries Team allowed to include in KaRo for the first time also results from the Polish Digital Libraries Federation. From now on KaRo users will be able to find out with one query if particular publication is available on-line in one of DLF digital libraries and if it is included in the catalogue of one of the libraries. Sample search results are on the screenshot below. Integration between KaRo and FBC was made with the use of OpenSearch protocol. detailed information on DLF OpenSearch API can be found here. New version of KaRo was developed as a part of NUKAT – AUTOSTRADA INFORMACJI CYFROWEJ (NUKAT – HIGHWAY OF DIGITAL INFORMATION) project . Which digital library software systems are used in Poland? Number of digital libraries registered in the DLF Digtial Libraries Database reached recently 80, and if the dynamics of growth will be as good as it is, then by the end of the year this number may even reach 100. Beacuse of this we have decided to prepare a basic analysis showing, which software is presently used in Poland as a basis for digital libraries. 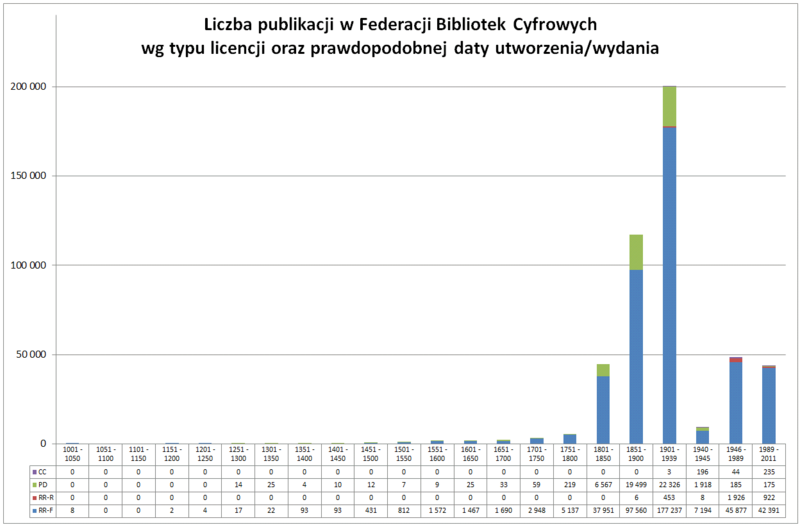 As a base data we took the conents of the mentioned Digital Libraries Database of the Polish Digital Libraries Federation (data snapshot taken on 2011/08/22). From this data before the analysis we have removed Polish Internet Library (32 071 objects), whis was created as a ministerial project with dedicated financing and was active from 2002 to 2007. This digital library was created in a way significantly different that any other library connected to the Federation, nad chances for repeating such project nowadays are really low. Additionallu in the analysis we were not able to include the information about the number of objects from “Ziemiańska Biblioteka Cyfrowa” and “Teledetekcja Środowiska“, because the software they use is not providing such information. The table below contains the list of used digital library systems (in alphabetical order) together with the list of their deployments (in order respective to the number of available objects). Next table contains information about publicly available deployments of particular digital library software systems and about the total number of publications in digital libraries based on these systems. We hope that persons looking for suitable digital library software will find this analysis useful. Europeana, open data and Hack4Europe! We recommend you an interview about Europeana and open data which this portal is going to publish. The interview (in Polish) is available at History and Media blog. Europeana, otwarte dane i Hack4Europe!